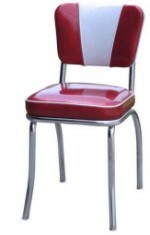 Diner Furniture & Retro Furniture - We offer a complete collection of commercial quality 1950's diner furniture with a variety of retro diner chairs, retro bar stools, retro diner tables and retro diner booths. We also offer NFL bar stools and Coca-Cola® diner furniture that together create the ideal look for your kitchen, diner, restaurant, bar or office - wherever you need quality seating. Every chair, bar stool, booth or table can be made in any color. Your business is always appreciated. If there is something we can help you with just send us an email or give us a call. MADE IN THE U.S.A.! Check out our 'Quick Ship' sale items today!